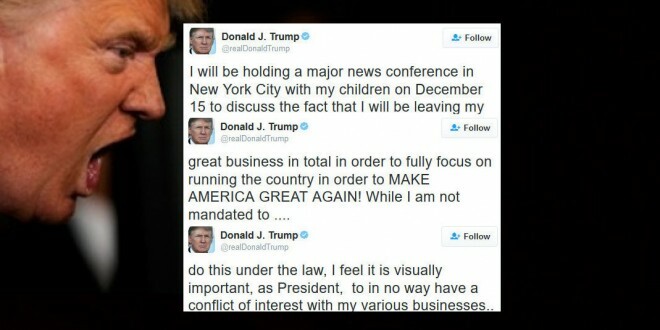 Trump Vows To "Leave My Great Business" - Joe.My.God. President-elect Donald Trump announced Wednesday morning that he will leave his “great business in total in order to fully focus on running the country” in the White House. The Manhattan billionaire made the announcement on Twitter and said he will hold a formal press conference to discuss it further on Dec. 15. Trump promised throughout the presidential campaign to hand over control of his business empire to his adult children if he were to win the White House, but that has done little to assuage the concerns of those who have been critical of the real estate mogul. Trump’s plan to have his children run his businesses leaves much room for skeptics who believe he will still be able to influence his companies to benefit from the policies he pursues as president. Candidates have historically pledged to place their assets into a blind trust should they win the presidency, but Trump’s plan to hand control to his children would fall short of that threshold. He did not clarify Wednesday morning twitter flurry what, if any, further steps he would take to ensure that no conflicts of interest would occur.